"Auscultation of llamas and alpacas is difficult and frequently unrewarding. Little air movement is heard under normal conditions, and identification of areas of infection, congestion, or consolidation is usually not easy. Lateral radiographs may be required for the diagnosis of pneumonia. Bacterial infections of the lung are relatively rare, with Streptococcus and Corynebacterium spp being the most common isolates. Chronic obstructive pulmonary disease appears to be increasing in frequency. Animals allowed to live to their expected lifespan is a factor, but feeding practices can contribute to onset as well as exacerbation of clinical signs—coughing, shortness of breath, and expiratory dyspnea. Therapy includes changing the feeding regimen to reduce dust, molds, and pollen. Bronchodilators and steroids may be helpful but remain unproved." *Auscultation: the act of listening, either directly or through a stethoscope or other instrument, to sounds within the body as a method of diagnosis. Generally, llamas are pretty disease free. Most of their problems come as a result of parasites or breeding or birthing problems. However llamas can suffer from some external and internal diseases. One in particular is very deadly - endogenous lipid pneumonia. Although there are several, observable signs and symptoms of the disease, very often, as stoic as llamas are, the symptoms are not easily recognized and death comes upon the animal suddenly and quickly. Endogenous lipid pneumonia is a disease that attacks the lungs of llamas and causes respiratory failure, similar to pneumonia in humans. More specifically, the disease causes collections of lipids (fats and cholesterol) to build up in the alveoli of the animal's lungs. The disease is actually very rare in llamas, relative to other, more prevalent, diseases, such as internal parasites, including worms and botfly infections. A llama afflicted with endogenous lipid pneumonia will exhibit several physical symptoms. In the early onset of the disease, the animal will show subtle difficulty in breathing and energy. These symptoms will worsen as the disease progresses, until the animal shows extremely labored breathing and inability to work or move without assistance. The llama will also show a reduced body temperature and increased heart rate. Other symptoms that are not immediately visible include the presence of fatty lesions in the lungs of the animal. Once the lungs become reduced in function, the llama's other body systems begin to fail and shut down. Though the disease is rare, it is often fatal in llamas. Due to the rareness of the disease, there is little known to science in the way of treatment, and there is no way to prevent the disease. Endogenous lipid pneumonia is also accompanied by pulmonary alveolar histiocytosis, in which the alveoli of the lungs essentially burst and deflate. According to Dr. A.N. Hamir, the disease is thought to be caused by parasite infections. Although the following article is not focused on llamas or alpacas, it may help to understand pneumonia more clearly. This is a fact sheet from the Health Management section of the Alberta Feedlot Management Guide, Second Edition published September 2000. Interstitial pneumonia (IP) is a frustrating and poorly understood respiratory disease that sporadically kills feedlot cattle, usually after they have been on feed for several months. Affected cattle may be found dead without showing any signs of disease or they may show laboured, rapid, open-mouthed breathing for a few hours to days before dying. The cause of most cases of interstitial pneumonia in feedlot cattle is unknown and it may be different in different feedlots or age groups. To date, there is no good evidence that bovine respiratory syncytial virus (BRSV) infection is a major cause of IP in feedlot cattle. Most cattle dying of IP have preexisting lung disease. Based on this observation and the fact that so little else is known about the disease, the only rational recommendation that can be made for the prevention of IP in feedlot cattle is to prevent other types of possibly predisposing respiratory diseases, such as pneumonias caused by Pasteurella or BRSV infection. Interstitial pneumonia is a significant and frustrating cause of economic loss in feedlot cattle. Unlike Pasteurella pneumonia, interstitial pneumonia (IP) usually does not occur in outbreaks in recently arrived cattle. Instead, IP occurs sporadically in cattle that have been on feed for several months, particularly in animals that are close to market weight. Affected cattle may be found dead without showing any signs of disease, or they may show laboured, rapid, open-mouthed breathing for a few hours to days before dying. The only way to definitively diagnose IP is by post-mortem examination. If an animal shows laboured breathing for a few days and then recovers, we cannot be sure that the animal had IP and not some other disease. Therefore, only fatal IP has been studied. Little recent work has been done to determine the incidence of this problem. A study conducted in the early 1980’s reported that total losses due to IP were 0.1 - 0.5% in a large California feedlot (1). In the early 1970’s, IP accounted for 5% of deaths in a large Colorado feedlot (2). Although IP does not kill nearly as many cattle as bacterial pneumonia does, IP losses tend to occur later in the feeding period when investment per head is relatively high. Although we have learned much about the causes and prevention of Pasteurella pneumonia, the cause and prevention of IP in feedlot cattle is still a mystery. Interstitial pneumonia is particularly frustrating for veterinarians and producers because diagnosis of IP in one animal does not allow us to formulate management strategies to prevent further losses. Lungs can be thought of as large sponges that inflate and deflate as an animal breathes. Like sponges, lungs are composed of tiny, thin-walled sacs (alveoli). The sacs contain air that is replaced with every breath, and the walls of the sacs contain small blood vessels. The extremely thin walls of the air sacs allow oxygen in the air to move into the blood, and carbon dioxide (CO2) in the blood to move into the air sacs. The CO2 is expelled when the animal exhales. This process is called gas exchange, and anything that interferes with this process may cause poor performance, disease or death. Pneumonia is inflammation of the lungs. Inflammation is the body’s response to damage. When lung cells are damaged, due to any cause, the lungs become inflamed, and the animal has pneumonia. Inflammation involves the movement of fluid and white blood cells from the blood into the tissue. In most cases, this movement of fluid and cells helps the animal repair the damage and destroy the viruses or bacteria which caused the damage. Unfortunately, there are only two places for the fluid and cells to go in the lung. They can accumulate in the walls of the air sacs or in the air sacs themselves. In either location, the presence of fluid and white blood cells interferes with gas exchange. That is why it is often stated that the response (pneumonia) to the damaging agent often hurts the animal far more than the agent itself. As stated above, the lung can respond to damage in two major ways. The way the lung responds depends on the type of damage and the type of agent that causes the damage. That is, different types of agents cause different types of pneumonia. In feedlot cattle, there are basically two important types of pneumonia. One type (bronchopneumonia) occurs when bacteria are inhaled into the lung. An example of this type of pneumonia is pneumonic pasteurellosis (shipping fever), which is the most economically important type of pneumonia in feedlot cattle. In this type of pneumonia, cells accumulate in the air sacs themselves (Photo 1). Photo 2. Cross Section of an IP Lung. Interstitial pneumonia occurs when fluid and white blood cells accumulate in the walls (the ‘interstitium’) of the air sacs. This causes the air sac walls to be thicker than normal, which increases the distance between the air and the blood, thus interfering with gas exchange. Actually, in the early phases of severe IP, fluid and white blood cells ‘leak’ out of the walls and accumulate in the air sacs themselves, just as occurs in bacterial pneumonia. Early investigators thought this was unusual for an IP (it really isn’t), so they added the term ‘atypical’. Calling an IP ‘atypical’ doesn’t really tell us anything, so the term ‘atypical’ isn’t used in this fact sheet. In most cases, IP can be definitively diagnosed by post-mortem examination of the lungs. 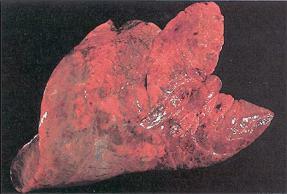 The entire lung, or only the back, upper portions may be affected. 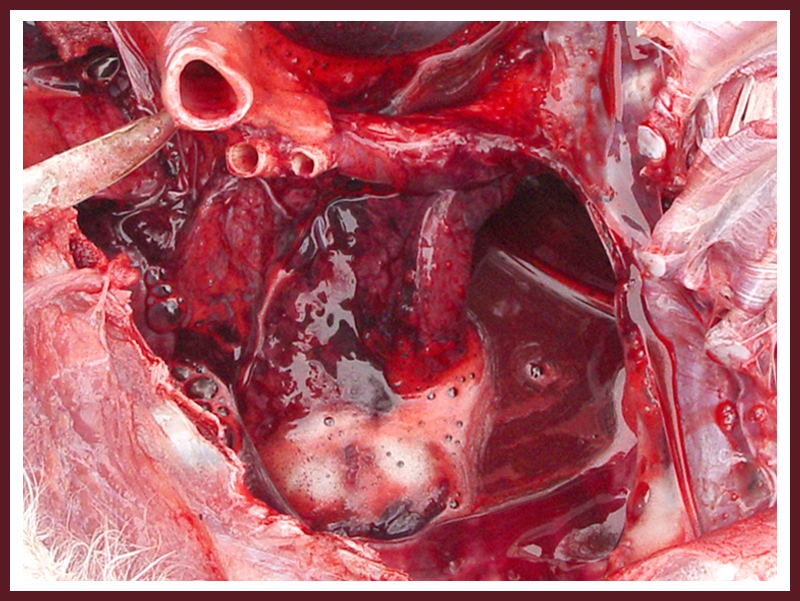 Photo 1 shows an entire lung with IP, and Photo 2 show a cross section of an IP lung. Lungs with IP are typically mottled red and tan and enlarged because they cannot collapse normally, since the air sac walls are thickened by fluid and cells. There may be pockets of trapped air within the lung’s connective tissue. Most importantly, affected parts of the lung feel rubbery instead of soft and spongy. 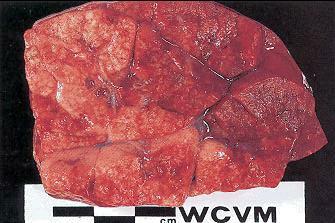 The texture of IP lungs has been compared to ‘stale marshmallows in a plastic bag’. In some cases, microscopic examination is required to confirm the diagnosis. If several cases of IP occur over a short period of time, samples of lung tissue or entire lungs should be submitted to a diagnostic laboratory to try to rule out other (preventable) causes of pneumonia. bovine respiratory syncytial virus (BRSV). moulds - mouldy sweet potatoes. As can be seen, several very different agents can cause IP in cattle. Therefore, a diagnosis of IP usually does not point to a single specific cause. In fact, probably the most useful thing that a diagnosis of IP does is rule out other causes of pneumonia. For example, a diagnosis of IP lets us be reasonably sure that we’re not dealing with an outbreak of Pasteurella pneumonia, since Pasteurella haemolytica bacteria do not cause IP. A diagnosis of IP also rules out infectious bovine rhinotracheitis (IBR), since IBR virus, at least by itself, does not cause IP. What Causes IP in Feedlot Cattle? The short answer is we do not know with any certainty. Most of the causes on the above list do not apply to feedlot cattle. Canadian feedlot cattle are usually not fed Crotalaria or purple mint (plants found in the southeastern U.S.), nor are they fed mouldy sweet potatoes, or suddenly exposed to lush pastures, or exposed to pig manure, or confined in dusty dairy barns. Lungworms may be a problem in pastured cattle, but they are usually not found in feedlot cattle. Bovine respiratory syncytial virus (BRSV) is often put forward as a cause of IP in feedlot cattle (5). One reason for this association is that feedlot operators and veterinarians report cases of IP several weeks after an outbreak of BRSV infection in a group of feedlot cattle. Furthermore, acute severe BRSV infection can sometimes cause an IP that looks exactly like many cases of IP in which BRSV infection is not present. However, studies in both Saskatchewan (S.D. Sorden, unpublished data) and Alberta (J. Ellis, personal communication) feedlots have failed to find evidence of BRSV infection in most cases of IP in feedlot cattle. Others have speculated that IP in feedlot cattle represents a type of allergic response (6), or that IP is caused by excessively dry and dusty conditions. Again, there is no evidence to support these claims. In southern Alberta, IP affects heifers much more often than steers, and seems to be a particular problem in early spring after a snow storm in pens that have been extensively bedded. Understanding why IP is more of a problem in some groups of cattle than in others should ultimately help us determine its cause. What is known is that lungs from cattle that die from IP often have evidence of other, long-standing lung disease (1, S.D. Sorden, unpublished data). Some lungs have IP in their upper, back portion, and another type of pneumonia in the lower, front portion. This combination is sometimes referred to as ‘upstairs-downstairs syndrome’. The presence of preexisting lung disease in many cases of fatal IP in feedlot cattle may mean that damaged lungs are somehow more prone to develop IP. Additional research will be required to demonstrate a cause and effect relationship. Treatment of cattle in severe respiratory distress is often not successful. The added stress of moving the animal into a treatment area may be enough to cause death. 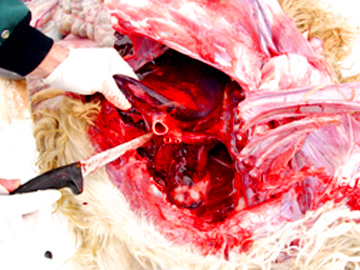 Emergency onsite salvage slaughter of severely affected animals is probably the best option. Recommendations for the prevention of a disease are best made when the cause of the disease is understood and when controlled studies have compared different methods of prevention. Since the cause of IP in feedlot cattle is unknown, the disease cannot be reproduced experimentally. The incidence of IP is low and often varies from year to year in a given feedlot, making prevention strategies difficult to evaluate. Since we do not know what causes most cases of feedlot IP, we do not know how to prevent them. Feeding monensin (Rumensin®) or similar ionophore drugs helps to prevent the IP syndrome that occurs in adult cattle suddenly exposed to lush pasture. However, monensin feeding appears to have no effect on the incidence of feedlot IP (1). One thing we do know is that most feedlot cattle dying of IP have preexisting lung damage (1, SD Sorden, unpublished data). Therefore, a conservative recommendation that can be made is to take steps to prevent other types of respiratory disease, such as Pasteurella pneumonia or BRSV infection, which may predispose an animal to developing IP. Better recommendations for the prevention of IP in feedlot cattle will not be possible until we have a better understanding of this mysterious disease. Hjerpe, C.A. 1983.Clinical management of respiratory disease in feedlot cattle. Vet Clin North Am: Large Anim Pract 5:119. Jensen, R., Pierson, R.E., Braddy, P.M., et al. 1976. Atypical interstitial pneumonia in yearling feedlot cattle. JAVMA 169:507. Kerr, L.A., Linnabary, R.D. 1989. 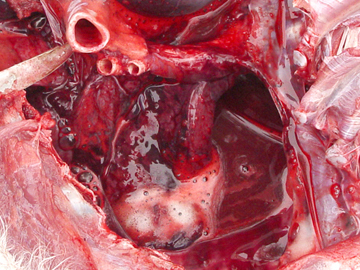 A review of interstitial pneumonia in cattle. Vet Hum Toxicol 31:247. Johnson, B. 1991. Nutritional and dietary interrelationships with diseases of feedlot cattle. Vet Clin North Am: Food Anim Pract 7:133. Collins, J.K., Jensen, R, Smith, GH, et al. 1988. Association of bovine respiratory syncytial virus with atypical interstitial pneumonia in feedlot cattle. Am J Vet Res 49:1045. Schiefer, B., Jayasekara, M.U., Mills, J.H.L. 1974. Comparison of naturally occurring and tryptophan-induced bovine atypical interstitial pneumonia. Vet Path 11:327. Steven Sorden, DVM, Ph.D., Veterinary Diagnostic Laboratory, College of Veterinary Medicine, Iowa State University, 2000. Alberta Feedlot Management Guide. A disease normally found in horses, heaves has been thought to be found in llamas also. Owner says the problem will never go away but can be managed by keeping them away from large hay bales, mold, or dusty hay. "The terms heaves and recurrent airway obstruction (RAO) refer to horses with overt increased respiratory efforts at rest that can be reversed by administration of bronchodilators, corticosteroids, or a changes in the horse's environment such as avoiding exposure to offending allergens like dust and molds from hay. The term inflammatory airway disease (IAD) is used to describe horses with more subtle clinical signs such as poor performance, exercise intolerance, or coughing, with occasional excess respiratory mucus. Horses with IAD do not display any obvious increased respiratory effort at rest or signs of infection, such as fever or changes in blood counts." A horse with heaves (generally referred to in scientific literature as RAO) displays distinct signs that alert an owner to a problem. Couëtil notes the most common clinical signs reported by owners of horses with RAO are exercise intolerance, coughing, and increased breathing efforts such as nostril flare and abdominal efforts to breathe. He says that clear to mucopurulent (containing mucus and pus) nasal discharge is also reported in association with these conditions, but less frequently." Heaves is an allergic-based disease that compromises your horse's ability to breathe, similar to the way asthma affects humans. When your horse is exposed to allergy-producing substances in the air, such as dust and pollens, cells in his lungs react by releasing chemicals that cause air-passage linings to swell, thicken, and produce mucus. When he breathes, air gets trapped within these thickened passages. He then must use extra effort to expel this trapped air. The more your horse is exposed to allergens, the more sensitized his lungs become. The disease is most common among mature and older horses.